Hermiston High School educates a growing population, serving approximately 1500 students grades 9-12, with over 120 dedicated teachers and support staff members. The largest high school in all of Eastern Oregon, Hermiston provides a robust offering of content courses as well as a variety of elective curriculums that are tied to regional college degrees, certificates, and programs. Annually, over 5000 college credits are earned across six recognized Programs of Study through partnerships with various community colleges and institutions of higher education, instructed on campus by qualified HHS staff. Performance across the disciplines has been strong, where Hermiston High School students perform at or above the state average and consistently outperform schools of similar constitution. An extremely low drop-out rate, one of the highest completion rates in the state, and a culture towards “Destination College” has been well established where nearly 60% of high school graduates attend 2 and 4 year institutions following graduation. The newer, ~300,000 square foot campus, is exceptionally well-maintained and boasts some 70 classrooms, 9 computer labs, media center, student fitness complex, comprehensive CTE and fine arts facilities, an on-site alternative school, and a robust online learning program. A new $5.0M sports facility recently lauded as “The Best Prep Stadium in Oregon (OregonLive, 2014)," provides a state-of-the-art collegiate-level track and field complex and all-weather football and soccer surface. This year’s State Champion Football program, seven-time state wrestling champions, and consistent state-contenders in various other programs, are just a few of the athletic accolades and powerhouse programs Hermiston is well known for. Hermiston High School utilizes a semester schedule and modified block system that provides a combination of 50 minute and 90 minute classes during each week. Students are offered 4 different diploma completion options, with the alternative high school offering a GED preparation track as well. 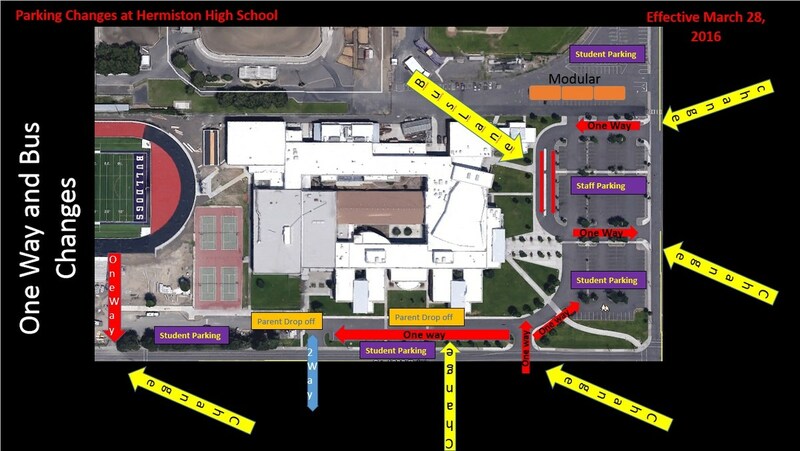 A diverse student body, a strength of the community and the school, Hermiston High School is comprised primarily of students who are considered Caucasian (55%) with the largest minority being of Hispanic decent (40%). State-recognized co-curricular organizations such as FFA, FCCLA, DECA, and Robotics boast large numbers of students and incredible community support. Likewise, club activities in such areas as Spanish, science, Key Club, outdoor, knowledge bowl, rodeo, and National Honor Society are just a few of the additional offerings students participate in. Starting school 45 minutes late on Wednesdays gives teachers time to collaborate with one another, helping us to serve you and your children better.